Click on LOGOS to go to Sponsors' / Raffle Donors' / Advertiser's websites - not all have one. If you do make use of any advertisers' or Sponsors' services, please tell them you found their contact from this website - it may persuade them to continue supporting us in the future - thank you. 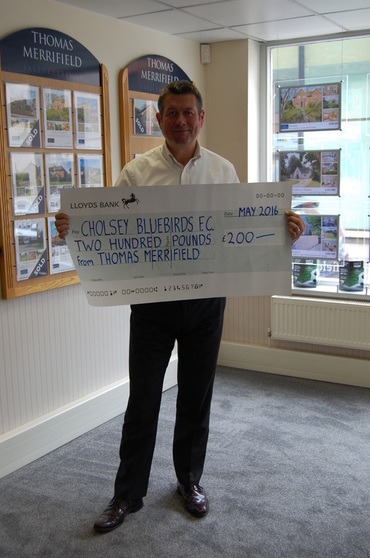 Thomas Merrifield are one of Oxfordshire's largest independent local estate agents with high profile offices across the county. Property is our business so whether you are looking for friendly advice on selling, buying your first property or becoming a landlord we are here to help. 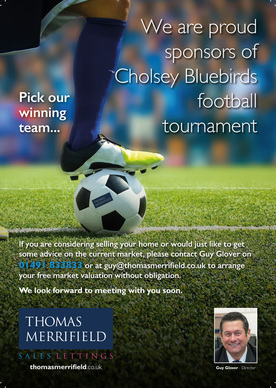 We are very proud to support the Cholsey Bluebirds FC Summer Tournament for the FOURTH CONSECUTIVE YEAR - one of the best Tournaments in the County. Guy Glover (Manager) CLICK on our LOGO (above top left) for link to our website. If you need it . . . we've got it. Come and pay us a visit and see for yourself. 36 members of all abilities. HCs range from 5 to 35. Play monthly, usually 3rd Friday at local courses within an hour's drive of Cholsey. . . . . you will be assured of a warm welcome and you won't meet a friendlier group anywhere in the country ! All your garden needs catered for at very reasonable rates. Personal sponsorship because we just love the Bluebirds ! Hundreds of fabulous, exhilarating & unique "Experiences ". This is the start of an experience that will live in your memory forever. Whether you want a vibrant party, a calm reflective cruise amid the splendour of the Royal River, famed throughout the world, or a family occasion, be it a wedding, birthday or christening, we are here for you. A fleet of superb boats, maintained and fitted out to the highest specification are waiting to carry you into another world. The facilities and events are just too numerous to mention here but we cater for the whole family come rain or shine - spend a day with us and you'll definitely want to come back. Valued by the trade and public alike. Discover the fun at Krazy Playdays. In 1956, Beale Park was formed by Gilbert Beale who decided to give this beautiful 350 acre, Thames-side park land to ‘the people’ by converting it from private farmland into a non-profit making, charitable trust. In those days it was little more than a track and a couple of ponds. Gilbert’s great nephew, Richard Howard and his family, together with a dedicated team of staff, some of whom have been associated with the park since the 1940s, have made the park what it is today, a unique and enchanting garden, specialising in captive breeding of rare birds and organic farming, providing a relaxing environment for visitors of all ages. There is a huge array of attractions now ranging from a brand new education facility, nature trails, owlery, and a deer park to summer river cruises, adventure playgrounds and paddling pools, set against the backdrop of the River Thames. Fairytale Farm is divided into six main zones: Huff and Puff for adventure play; Enchanted Walk for our fairytale sensory experience; Alfie and Friends, where you can meet our amazing animals; Jack's Yard, where you can visit Mouse Town, play in our sandpit and enjoy our Café and indoor play area; our brand new Wilderness Walk area (opening Spring 2018), where you can meander through a range of wildlife habitats and experience our mini world of seasonal senses along the way; and the gradually developing Fairy Dell area, with more features being added all the time. Crocodiles of the World was founded in 2011 by crocodile conservationist, Shaun Foggett. The first zoo was located at Crawley Mill, Witney. However with increasing visitor numbers and a growing population of crocodiles, the zoo needed to move and opened new premises in Brize Norton (the former Foxbury Farm site) in February 2014. Crocodiles of the World is the UK’s only crocodile zoo and is currently home to more than 150 crocodiles representing 15 different species including crocodiles, alligators and caimans, as well as other reptiles. A masterpiece of Baroque architecture, Blenheim Palace provides an awe-inspiring experience for visitors. Enter the Palace and explore the gilded State Rooms and priceless collections set against striking stonework, and experience the beauty and magnificence of this Grade I listed building. The Soldiers of Oxfordshire Museum is not a Regimental Museum more a Military Museum related to the connection between the Military of Oxfordshire and the County in which they are based, hence our strap line of "Conflict and County". Bekonscot Model Village and Railway is the world’s oldest and original model village, opening for the first time in 1929. With over 80 years of history, huge model railway, 1.5 acres of well kept gardens and finely detailed model buildings Bekonscot is a great day out for everyone. Stuck in a 1930s time warp, see England how it used to be, and discover a wonderful little world tucked away from the hustle and bustle of everyday life. Pendon Museum preserves the idyllic rural scene and transport of the 1920s and 30s in a miniature form for future generations to enjoy. There is much to see, from the pioneering Madder Valley Railway, through Pendon’s first complete model – Dartmoor Scene – to the breathtaking Vale Scene that is fulfilling the original dream. With over 30,000 square feet of fun and fearlessness, Rush is the most exciting place for bouncers of all ages. Rush’s super-accessible location has turned us into one of High Wycombe’s most popular activity centres and in-demand event venues – whether you’re looking for somewhere to hang out after school, plan your next family birthday shindig, or host an unforgettable office party. ​We like to think of ourselves as a heaven for kids and a haven for parents. With over 100 wall-to-wall trampolines, and an almost endless supply of exciting equipment, we have everything your kids need to have a bounce, have a blast and burn off some of that energy! Set in over 160 acres of beautiful parklands the Park has an amazingly diverse collection of species many of which are endangered in the wild. Our dedicated and caring Keepers are passionate about the animals in their care and the opportunity to share their knowledge with the public. ​Our beautiful gardens are carefully tended by our creative team of gardeners who make every corner of the Park a joy to visit. exCLUEsive games is a LIVE ACTION ESCAPE GAME in Newbury, Berkshire. If you love mental challenges, puzzles and quizzes, exCLUEsive games is a must do experience. You have 60 minutes to solve the puzzles, find the keys and crack the codes to unlock the door and escape. Enjoyed by families, friends and corporate event groups, our escape room challenges help with team building, communication, problem solving and logical thinking skills. ​Over 2000 "Experiences" up for grabs ranging from under £50 to the unique once in a lifetime offers - there's something for everyone, whatever age you are, whatever price range you can afford. TRY US ONCE and you'll KEEP COMING BACK ! We are a very friendly business who pride ourselves on our service and quality at very competitive prices. R & L Preservation are a small family run business with 30 years experience in the treatment of rising damp, condensation, timber treatment, basement tanking/structural waterproofing and specialist replastering. We are affiliated to the following trade organisations which ensures we are a creditable company who will always put you the customer and your property first. Downlands has excellent facilities for both dogs and cats. Staff are on-site day and night, to ensure the health and safety of the animals in our care. Special diets and medications can be administered to both dogs and cats if necessary. Entertainment, 5 League Darts teams, 3 Crib Teams & Dominoes. EDI have vast experience and the technical staff to provide Domestic, Commercial & Industrial Electrical, Computer Room and Network Installation Services, to Complete Office Design and Refurbishments.